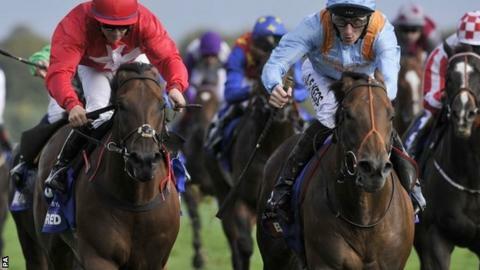 G Force and Daniel Tudhope upset the form book to win the Betfred Sprint Cup at Haydock by almost a length. The David O'Meara-trained 11-1 shot sprinted past Gordon Lord Byron in the final metres to win, with Music Master third and favourite Sole Power fourth. Gordon Lord Byron was looking to become the first horse since Be Friendly in 1966 and 67 to win the race twice. Sole Power, stepping up from five to six furlongs, was aiming to complete a 2014 Group One hat-trick. Trainer Eddie Lynam was seeking a clean sweep of British Group One sprints this season - having triumphed with Sole Power (King's Stand and Nunthorpe Stakes) and Slade Power (Diamond Jubilee Stakes and July Cup).